“Over the weekend, she will appear at another private event in California that is hosted by CAIR-CA PAC, a political action committee affiliated with the Council on American Islamic Relations, or CAIR a group that was named as an unindicted co-conspirator in a massive terror-funding incident,” the news outlet added. 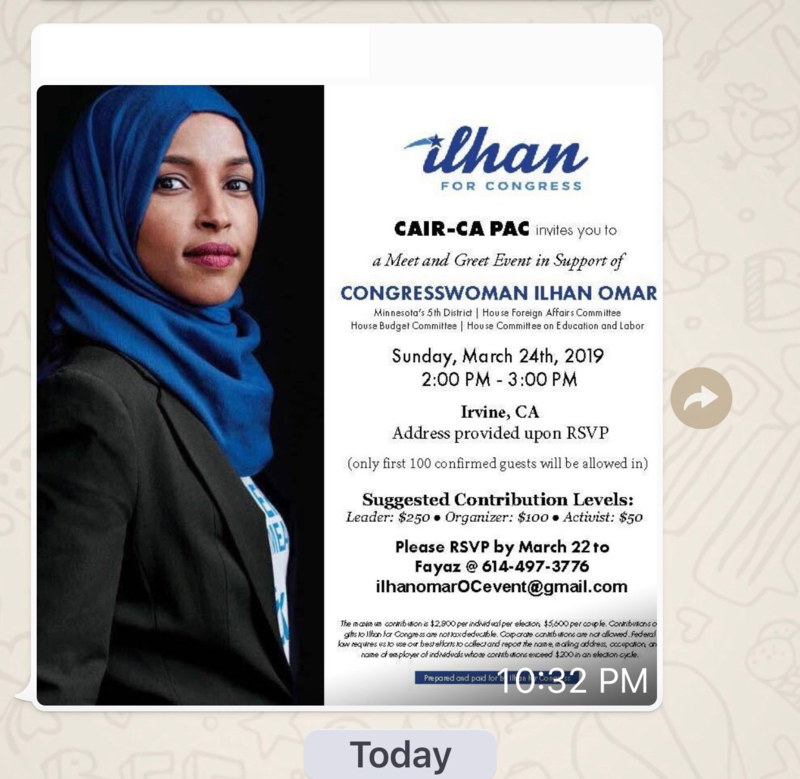 “The U.S. Department of Justice listed CAIR as an unindicted co-conspirator in funding millions of dollars to the terrorist organization Hamas. Additionally, the United Arab Emirates (UAE) named CAIR a terrorist organization along with al-Qaeda and ISIS in 2014,” the DCNF further noted. The Beacon wondered — given Omar’s very controversial public statements about Israel, condemned by many as anti-Semitic — what sort of things she may be saying behind closed doors. “With Omar’s popularity skyrocketing on the anti-Israel left, it appears her rhetoric is translating into fundraising prowess,” the news outlet reported. Earlier this month, Omar stirred further controversy when she said at a bookstore event, “I want to talk about the political influence in this country that says it is OK for people to push for allegiance to a foreign country,” The Hill reported. The congresswoman praised its inclusion as a “historic” win.